Do you need an appealing way to get stacks of marketing material off of your table space and into a professional display? 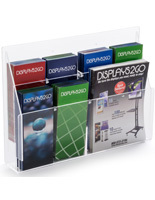 Our adjustable countertop brochure holders organize multiple forms of printed media in the different shapes and sizes. 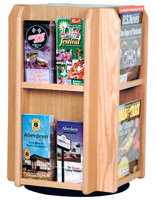 Literature racks are essential tools for any business. Each unit offers take-away information to their customers and boost engagement. Providing informative periodicals and pamphlets for review educates your client base on industry-related news and special promotions. 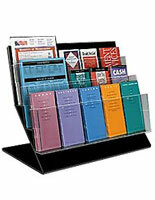 Use adjustable countertop brochure holders to share product catalogs and drive sales. 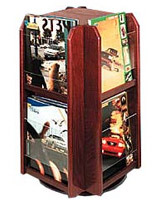 Position a magazine or literature display in high-traffic areas such as reception desks and checkout counters to entice passersby to bring information home. 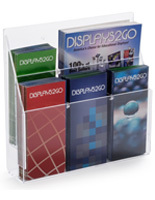 These visible adjustable countertop brochure holders don’t just sit and wait for marketing material to be taken, they bring the content to your customer where they frequent most! What are some features that make these literature racks stand out? 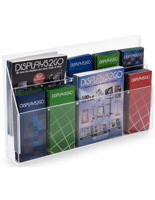 Most countertop brochure holders are constructed with durable clear acrylic that naturally blends in with the existing decor of any office, studio, or retail store. The hard shell maintains its luster through years of heavy use and features plastic dividers. Other models are made with black wire mesh, providing an upscale appearance, and utilizing hanging hook spacers. 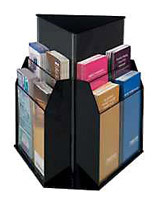 Not only are these countertop brochure holders adaptable to various sizes of printed material, but each of these units feature multiple pockets. On the low end, we offer cases that can be changed between two and four pockets. 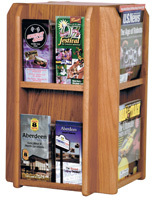 On the larger scale, some countertop brochure holders support up to fifteen different pamphlets. 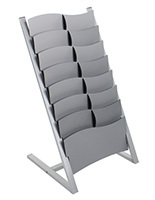 Maximize visibility of diverse marketing campaigns, or simply share as much information as possible with multi-pocket racks. 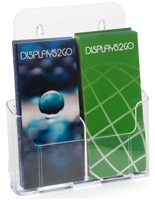 Some brochure holders are versatile in that they can be used on table tops and include wall-mounted capabilities. 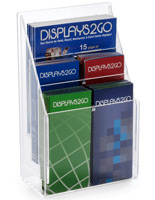 This helps marketers diversify their displays by using the same fixture as both a space saving and visually accessible option. 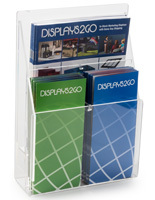 Use brochure holders to maximize the efficiency of your printed marketing displays and get more information into the hands of your customers. 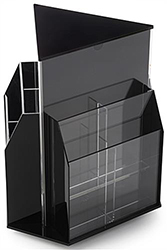 These tabletop models are small, lightweight, and portable, ideal for use in trade shows, pop-up stores, and chain locations. The functionality of these holders mean that they will boost engagement, increase brand awareness, and be able to find a home in any industry. 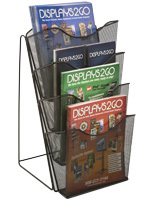 For more permanent fixtures, browse our catalog of wall mounted literature racks to showcase larger selections of printed media. Knowledge is powerful, so make sure that your business is putting the right information in the hands of your customers to keep them coming back.